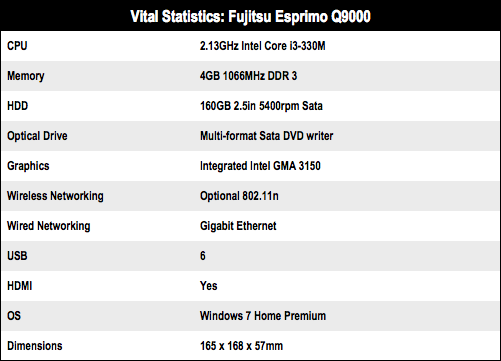 Review Fujitsu's Esprimo Q9000 packs the guts of a laptop into a tiny desktop system. There’s a 2.13GHz Intel Core i3-330M with integrated Intel HD graphics, 4GB of DDR 3 memory, a 160GB Hitachi laptop hard drive and Gigabit Ethernet. There's an 802.11n Wi-Fi option - it was included in the test unit - and you can apparently spec up the Q9000 with a Core i5-520M if you want some more processing welly, though this model doesn't seem readily available yet. The package consists of the Q9000 and a mouse but does not include a display or keyboard. Fujitsu offers a Vesa mounting kit which will cost you an extra £55 if you fancy attaching the Q9000 to the back of your TFT. On the rear of the Q9000 there are HDMI and DVI-I outputs, and you get a DVI-to-VGA adaptor in the box. However, there is no expectation that you’ll be watching HD video discs as the DVD drive is a multi-format unit rather than Blu-ray. The slot loading drive is rather rough and you have to insert a disc almost the whole way before it's grabbed by the mechanism. When the system first runs you can decide whether you want a single hard drive partition or two partitions divided between system and data. 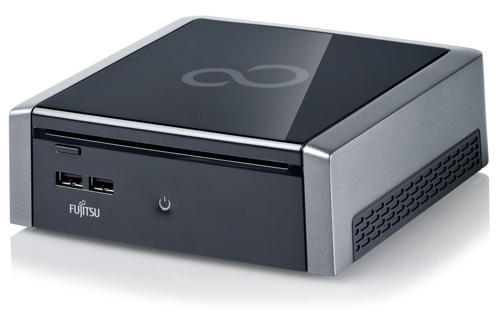 Fujitsu provides an app, LaunchCentre, to manage actions such as system recovery. In regular use, the Fujitsu is very quiet but when the system was under high load running 3DMark, the fan made a fair amount of noise. Pricey but solid mini PC for users seeking to compute rather than watch or play.